Cucina di Paolo (which actually means “food of Paul” I think) is a local gourmet take and bake lasagna shop in the heart of The Boise Bench. Or at least that’s how I’ve always known it. Paul’s lasagna’s are “to die for” good and the wife gets a lasagna there at least once a month. Oh, did I mention these lasagna’s come with gravy (bÃ©chamel sauce technically)? Garfield is jumping through the TV screen as I write! CRAZY GOOD. You’ve probably even seen it unknowingly since they sit in the shadow of the “Maytag Laundry Lady” on Vista! Truth is, Paul and Mary Jean Wegner (and clan) do a lot more than just serve up lasagna’s. 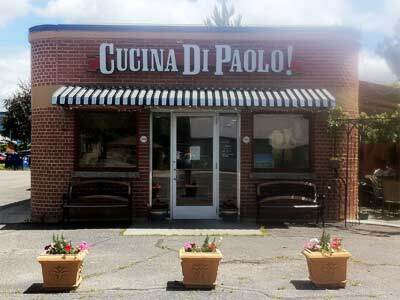 They have dine in options that range from soups and salads to pastas all of which can be enjoyed onsite (even on their patio)!Â Cucina di Paolo is also a full service catering company. Here’s the bottom line, if you haven’t ever been toÂ Cucina di Paolo, put it on your list. Eat in or take out. Either way, you’ll be thanking me!